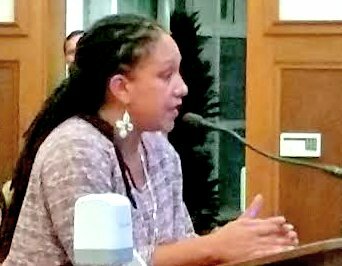 Family and community supporters seeking justice for Yuvette Henderson converged on the Emeryville, Calif., City Council on Sept. 1, demanding that the council call on the Alameda County Coroner to release Henderson’s autopsy report. The action was organized by the Anti Police-Terror Project. At least 30 people spoke during the council’s public comment period, each demanding the release of the report and the demilitarization of Emeryville’s police department, including the removal of AR-15 rifles and other assault weapons from their arsenal. In a door-knocking event the previous weekend, members of “Showing Up for Racial Justice” launched a petition campaign that received overwhelming support from Emeryville residents. Henderson, a Black woman, mother of four and grandmother, was killed in Oakland, Calif., on Feb. 3 by Emeryville police, who used weapons including an AR-15. An employee at the Emeryville Home Depot had accused her of shoplifting. Henderson had sustained a head injury from a Home Depot Security guard and requested an ambulance. When police came instead, she wound up fleeing to Hollis Street, just inside Oakland city limits, where she was shot and killed.